Bozovic Janko will be suspended for one game following a direct disqualification in the Men's Challenge Cup. Suspension of Bozovic Janko (RD Slovan/SLO) for one match of the EHF club competitions. Vienna, 9 April 2010 - The EHF Body of 1st Instance has dealt with the case of Bozovic Janko (RD Slovan/SLO). The body was called together following the direct disqualification of Bozovic Janko in the last seconds (59:51) of the Challenge Cup match between C.S.U. 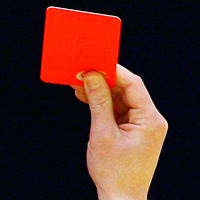 Suceava/ROU and Slovan/SLO, for an action of serious unsportsmanlike conduct. The game was played in the Quarterfinal of the Challenge Cup on 3 April 2010. As a result, Bozovic Janko has been suspended for one match of an EHF club competition. This means that he will not be eligible to play the next match of his team in the Challenge Cup Semi-final versus Sporting Clube de Portugal taking place on 24 April 2010 in Lisboa.